Niall Horan and Hailee Steinfeld shippers have been waiting for the two to confirm their relationship for what seems like forever. And now, they’re confirming their relationship by packing on the PDA. Yep, that’s right! They were just spotting kissing in public on a number of occasions, and they couldn’t look more perfect together. Just look at the lovebirds locking lips on a date night in Disneyland – our hearts can’t take it! Dating rumors have been swirling around the singers for quite some time – but they low-key flew under the radar for a while. 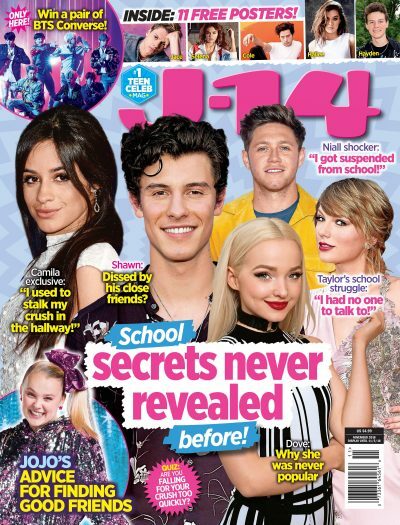 It seemed like they were just good friends, but speculation really sparked when Hailee posted a picture in a Niall Horan tee. So cute! A source even confirmed to E! News back in March that they were, in fact, a couple at the time. “It’s true that Hailee and Niall are dating, but at this point it’s still pretty casual,” the source said. The two were even spotted having a grand old time together at a Backstreet Boys concert in February, which caught the public’s eye. Fans also spotted the duo enjoying a night at the theater together in London when Niall and Hailee went to see Hamilton together at West End. And they seemed to have a blast hanging out. Hailee was flat out asked by Us Weekly what the deal is with her and Niall and she basically explained she has every intention of keeping her private life to herself. “I feel so lucky that [my fans] care enough about me to know what I’m doing every second of every day, but I think that sometimes it’s hard for people in general to realize that there are boundaries to a person’s life and personal life. I am a very private person. I do love that I have the opportunity to share with them what I’m comfortable with and they’re there to listen and support me,” she said. Hailee’s brother Griffin though seems to have found himself getting involved in this drama too since fans shared screenshots of the comments section on his Instagram where people seemed to be wanting proof his little sister is dating Niall. Griffin made it clear that’s not what he’s here for and agrees with the idea that hey, two people can be just friends and not have anything romantic going on. “Can’t believe you don’t know the words to your best friend’s song. I know all the words to every one of yours,” Niall said to Hailee as she reminded him the tune had just come out then and she needed more time to learn. So Niall himself let us know these two are best friends, giving us yet another precious public display of friendship with that video. And this all could’ve happened before they decided to take the next step in their relationship. The 24-year-old cutie also dedicated an Instagram post to Hailee for her 21st birthday – and it was truly the sweetest message we ever did see. Okay sure, there’s never a time Niall’s pure soul isn’t oozing kindness, but still. It was SO. FREAKING. GENUINE. “Happy birthday to the loveliest person on the planet and one of my best friends @haileesteinfeld . Have no idea what the hell is going on in this photo. Love ya hails,” Niall wrote on Instagram. Ugh, how cute is he? So yeah, now you see why we’re freaking out over the fact that they’re legit dating now. Their friendship was always super adorable, long before they became an item. Let us serve up some background info on these two, shall we? It appears as though their Twitter exchanges are limited. But the few interactions they did have were just lovely, really. In October of 2016, Hailee gave Niall a shoutout for his song “This Town,” and he tweeted back thanking her. Pretty standard celebrity Twitter convo, if you ask us. But could it be… they were they low-key besties at this time? Huh, our minds are blown. And then there was the time when Niall took over Spotify’s “Teen Party” playlist, Hailee was the lead image of the link he tweeted out. So naturally, she just had to respond – resulting in Niall teasing her, telling her she’s a total geek. So there you have it – the couple you never knew you needed in life is in full swing.